The eclipse has arrived. The moment the series has been building towards: what happened to turn Guts into the Black Swordsman and Griffith into the demonic Femto. 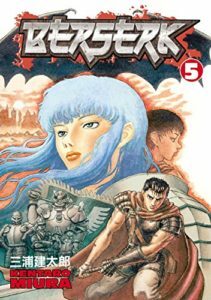 After losing everything, his body tortured and mutilated, his tongue removed, denied the ability to command his Band of the Hawk, Griffith faces a hopeless future as an invalid being cared for by Caska. What future is that for a poor orphan who dreamed of being a king? Of attaining that castle on the hill? He came so close. If it wasn’t for one man. If it wasn’t for Guts, the only person to ever make Griffith waver from his dream. The only person to ever make Griffith weak. No, before the Godhand, the demonic entities that create the apostles, he’s given a choice. Sacrifce Guts and the surviving Band of the Hawk, or let all those deaths, all those boys who perished, in service of attaining his dream be for nothing. He has one last chance to attain it. It just requires a few more sacrifices. Then he’ll never be weak again. We know how this ends. Mirua already showed us that Guts survives and that Griffith makes the choice. Now we just have to learn what happens next. Are their others? Will Caska, the woman Guts loves, survive, too? The feast of the eclipse has began. This is one of the most powerful pieces of fantasy out there. The images convey the emotions, while the character and story drives it forward. Miura has crafted these characters, built them so that when we got to this point, we understand what we read before. Why Guts is fueled by rage and anger, why he’s so desperate not to just kill Griffith, but to be noticed by him. We understand who Griffith is and what leads him to make that terrible choice. In a world of cause and effect, where free will is an illusion, Griffith had no choice to make. His dream was at hand. Circumstances had reduced him to a pitiful state but hadn’t robbed him of his drive to keep fighting. His will remains intact. His rationale is in place to commit such a horrific act. 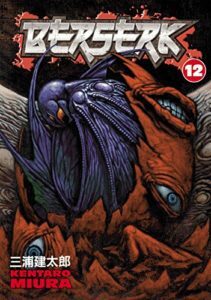 Volume 12 and 13 are why BERSERK is a masterpiece of not only graphic novels, but modern fantasy in general. You can buy BERSERK Vol 12 from Amazon. Griffith has entrusted Guts with the important rearguard position on their night raid. Feeling true responsibility for the first time, Guts won’t let his new mercenary company down. Though still a loner, Griffith’s trust in him has inspired him. But can his sword be enough to stem the tide of the enemy hunting down the hawk? Guts skills, while not the level of the Black Swordsman that he will become, are impressive. He’s young, only fifteen, but he’s grown up swinging a sword from childhood. Forced to use weapons sized for adults, it gave him strength. Now he swings a two-handed blade with skill. He will need it all to keep himself alive. And that’s not the only threat he faces. Because the legendary warrior, Zodd, is rumored to be on the battlefield. Some say he’s a hundred years and unkillable. An immovable object for the indomitable spirit of Gut’s unstoppable will to crash into. Miura continues to pen an epic story as he tells how Guts found himself with a new family. One that doesn’t abuse and belittle him. One that doesn’t sell his body for a few pieces of silver. He finds respect. Friendship. Admiration. For the first time in his life, he has found something, but will his own inner anger. His own rage at his childhood abuse destroy everything. Will Guts forever be that helpless child, vulnerable and overpowered despite how skilled he becomes. “Man takes up the sword in order to shield the small wound in his heart sustained in a far-off time beyond remembrance.” BERSKER is a world of cause and effect. That everything is determined because the way you are shaped dictates how any stimuli will cause you to act. We are seeing that chain of causes that lead us to the Black Swordsman. And to Griffith making the choice to take up his Behelit and sacrifice all to become a member of the Godhand. Miura has baked his philosophy into the very dough of his story, and now he just has to let it rise to its conclusion. You can buy BERSERK Vol 5 from Amazon.